Lois Genevie Crouse was born on October 1, 1919, in Melstone, Montana, but was adopted on December 22, 1919, and her name was changed to Evelyn Genevieve Sharp. She grew up in Ord, Nebraska, and took flying lessons at age 16, soloing on March 4, 1936, and earning her private pilot's license on her 17th birthday; October 1, 1936. 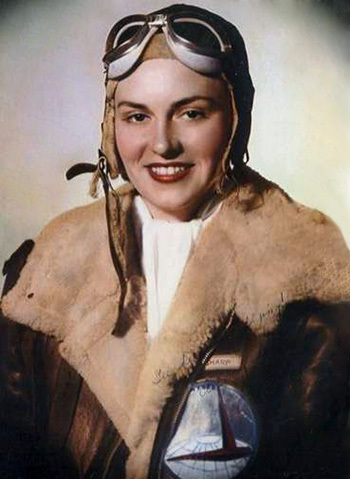 Evelyn earned her commercial transport pilot's license at age 18 (making her the world's youngest commercial pilot at the time), and then flew mail between towns in Nebraska, got into barnstorming at rodeos and fairs, and was a flight instructor in South Dakota and California before World War II. She was one of the first 28 original female pilots selected for the Women's Auxiliary Ferrying Squadron (WAFS) in September 1942, and then became a member of the Women's Airforce Service Pilots when the WAFS and the Women's Flying Training Detachment (WFTD) combined on August 5, 1943. Evelyn Sharp was killed when the P-38 Lightning fighter she was ferrying lost an engine on takeoff and crashed in Allen, Pennsylvania, on April 3, 1944. 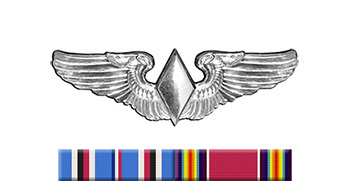 At the time of her death, she was a Squadron Commander with the WASPs, and was only 3 flights away from her fifth rating; the highest certificate available for women at the time. She was buried at the Ord Cemetery in Ord, Nebraska. The airport in Ord, Nebraska, was renamed the Evelyn Sharp Field Airport in her honor on September 12, 1948, and she was inducted into the Nebraska Aviation Hall of Fame in 1992. The WASPs were given official Military Veteran status in 1977, and they were awarded the Congressional Gold Medal on July 1, 2009, honoring their service during World War II.